Click HERE for official tour website/info. ​Read the official Playbill.com announcement HERE. ​ Tricia will be heading out to sea to be the Lead Female Singer for the MainStage production shows on the Zuiderdam for Holland America Cruise Lines. ​Catch her in the Caribbean, the Baltic, and Europe! Tricia will be heading back to Japan (and Taiwan) in the spring/summer of 2017 for the Spring Gala concert of Disney on Classic! She is thrilled and honored to be working with this group of singers and looks forward to reuniting with the Orchestra Japan. Click HERE for the official Harmony Japan announcement and singer bios. For venue and ticket information in Tokyo, click HERE. Tricia will be joining other Standbys and Understudies from the Broadway and Off-Broadway community to perform as part of this iconic and honorary cabaret. The evening will feature Steven "Heaven" Cantor (In Transit), Darlesia Cearcy (Shuffle Along), Lori Ann Ferreri (Sweet Charity), Ashley Perez Flanagan (Great Comet), Adam Grupper (Fiddler on the Roof ), Rory Max Kaplan (Bronx Tale), Peyton Lusk (Falsettos), Michael Minarik (Matilda), Aleks Pevec (Something Rotten), Sheri Sanders (Chix6), Brooklyn Shuck (Tuck Everlasting), and Tricia Tanguy (The Marvelous Wonderettes), with Eugene Gwozdz at the piano. The concert will take place at The Lion Theatre (410 W. 42nd St., New York, NY) and will be produced and hosted by Stephen DeAngelis. Click HERE to read the BroadwayWorld article. As of January 15, 2017, Tricia is the new "Wonderstudy" in the currently running Off-Broadway revival of The Marvelous Wonderettes! The cast includes Laura Woyasz (Missy), Jenna Leigh Green (Cindy Lou), Ryann Redmond (Suzy), and Sally Schwab (Betty Jean). ​Come see them at the Kirk Theatre in New York City! For tickets and more info about this production, click HERE. 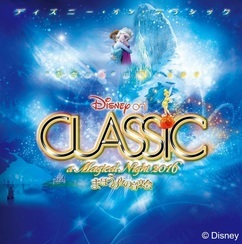 Tricia is thrilled to be heading to Japan in the fall of 2016 for Disney On Classic: A concert tour comprised of 8 singers and a 60-piece orchestra, 'The Orchestra Japan'. For more info., please visit the official website. The live concert recording is now available for purchase! 2014/2015: Tricia is currently on the road with the National Tour of Joseph and the Amazing Technicolor Dreamcoat. She is in the Ensemble and understudying the Narrator - American Idol's Diana Degarmo! Click HERE for the Playbill.com tour announcement. 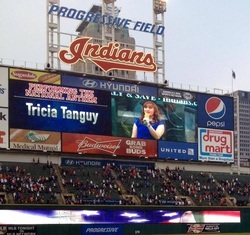 ​Tricia will be the National Anthem soloist for the 7:05pm MLB game, Cleveland Indians vs. Houston Astros. While at home with family during a scheduled break from the "Sister Act" tour, she is excited to show some hometown pride and sing again for the Tribe! July 15, 2013: Cast of Sister Act at "Broadway Barre"
Join members of the cast of "Sister Act" at Rockwell Table and Stage for Broadway Barre. BROADWAY BARRE is a monthly event where LA's vibrant musical theater community comes together to enjoy each other's company as well as perform for each other. Hosted by Broadway's talented and hilarious Kate Pazakis with musical direction by FTR's own Christopher Lloyd Bratten, this night is sure to be a fun and entertaining evening for every musical theater lover in LA!! On January 28, 2013, some of the most gracious and brightest stars of the Broadway community came together to honor the Newtown community, including the first responders and families of the victims at Sandy Hook. Joining in with some cast members from the Broadway company, the National Tour of Sister Act closed Act One with the moving and inspiring, "Raise Your Voice." To purchase the soundtrack, DVD, or Blue-ray, please click HERE. To read about the airing of the hour-long PBS special, click HERE. As one of the teachers for Broadway Connection, Tricia is 'spreading the love' of Sister Act through master classes and workshops with dance studios across the country! Click HERE to learn more about the program and to find out where you and/or your studio can locate or book a class near you! First National Tour of SISTER ACT! Tricia is currently on the road as part of the First National Tour of SISTER ACT ! She is in the Ensemble and understudies Mary Robert, Mary Patrick, Mary Martin of Tours, and Mary Theresa. For official tour website/info., please click HERE. JULY 30 & 31, 2012: Teaching for "NYCinMA"
Tricia will be teaching a variety of classes for two days at the end of July as part of Steps Off Broadway's Musical Theatre Summer Intensive, NYCinMA! Tricia will be performing as part of CABARET FOR A CAUSE at 8:15pm at the Cutting Room (44 E. 32nd St., NY NY) to raise money for the new musical 'Born Blue', which benefits St. Jude Children's Research Hospital. Featuring; Anthony Rapp, Caren Tackett, Lauren Elder, Laura Dreyfuss, Christine Nolan, Emily Afton, Aleque Reid, Katie Kiyan, Brett Benowitz, Emily Kinney, Nate Gray, Anna Ty Bergman, Laquet Sharnell, Tracy McDowell, Tricia Tanguy, Ryan Link, Jennafer Newberry, Pallavi Sastry, Eric L. Summers, Michelle Kinney, Brittany Campbell, Aurianna Angelique, Summer Hyde, Dawn Cantwell, Justin Catalino, Elise Levin, Sam Given, and Emma Hunton. Tricia will be apart of a 29-hour Equity reading in New York City of the new musical, The Courier. Music and lyrics by John C. Intracaso, Book by John Intracaso and Marc Acito, and Directed by Jeff Whiting. FEBRUARY 2012: Tricia is a BroadwayWorld Cleveland Award Winner! It is officially announced that Tricia has won the 2011 BroadwayWorld award for "Best Actress in a Musical - Equity" for her work as the 'Narrator' in Joseph and the Amazing Technicolor Dreamcoat in Cleveland! Click below to see the official announcement as well as the other winners. 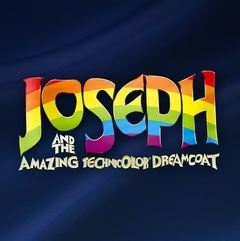 Tricia will be returning to Cleveland, Ohio this holiday season to once again play the "Narrator" in the Beck Center for the Arts' production of Joseph and the Amazing Technicolor Dreamcoat. Click here to read an article about Tricia returning to Cleveland for this production. Tricia will joining Lauren Elder and Bobby Cronin and performing in the opening ceremony of the Out of the Darkness Community Walk for AFSP, singing an original song by Bobby Cronin. Following the ceremony, they will be walking with the W2ML (Welcome To Me Life) team. Tricia will be making her directorial debut (and then staying to understudy) in "The Marvelous Wonderettes" at Merry-Go-Round Playhouse in Auburn, NY. AUGUST 14, 2011: "CABARET FOR A CAUSE"
Tricia will be performing as part of "CABARET FOR A CAUSE: The Stars of Today and Tomorrow" at 8pm at the Richmond Shepard Theater (309 E. 26th St., NY NY) to benefit The Wildfish Theatre, a children's theater in Houston, Texas. Suggested $10 donation at the door. Featuring: Autumn Hurlbert, Bobby Cronin, Brooke Cannons, Maddie McClouskey, Dana Steingold, Daniel Quadrino, Emma Zaks, Jessica Dillan, Miranda Zickler, Becca Kopec, Samantha Souza, Sasha Weiss, Nina Sturtz, Michelle Dowdy, Jessica Latshaw, Ben Cameron, Tricia Tanguy, Sara Sheperd, Brad Bass, Kelly King, Erik Sisco, Paul Pilcz, Mara Wilson, Tracy McDowell, Jenna Rose and more! Introducing 11 year old Mallory Bechtel from Texas! Tricia will be performing as part of a benefit concert for Japan! "Friends For Japan" was created after the earthquake/tsunami disaster that happened in Japan on March 11, 2011. Hundreds have been killed in this disaster and thousands have been left homeless, as the tsunami swept through, causing mass destruction and setting off widespread fires that burned out of control. The "Friends For Japan" benefit concert will take place on June 6th, 2011 in NYC at Theater 54 @ Shetler Studios (244 W. 54th Street, NY, NY 10019). The silent auction will begin at 7:15 PM, followed by the performance at 8 PM. Guest performers include: Jennifer Dinoia (Wicked), Russell Fischer (Jersey Boys), Marty Thomas, Cast of Bobby Cronin's "Daybreak", and many more! Please come and support a great cause and lets help rebuild Japan together! Tricia will be playing the role of "Blaire" in the staged reading of Greed! 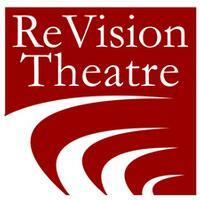 A New Musical, on Sunday, May 15th at 7:30pm at the Tada! Theatre (15 W. 28th St., 2nd floor, NY, NY). GREED! is more than a story of a young man who finds that the road to success is not always paved with gold. Set within the chaotic and comedic scene of today’s corporate scandals, it is about a society whose values have become severely disordered by materialism and a false concept of success. Book, Music, & Lyrics by Barry Libin and Musical Direction by Annie Pasqua. Tickets are available for purchase at http://www.emergingartiststheatre.org or by calling 800.838.3006. Tricia will be performing original songs by singer songwriter, Brandon James Gwinn, including "A Diva Song" (with Anne Fraser Thomas) and "Thanks" at 7pm at the Duplex (61 Christopher St., NY, NY). The evening will also feature performances by: Broadway's Tituss Burgess, Brandon James Gwinn, Patrick Kuzara, Bobby List, Nikki MacCallum, Dana Schaaf, and Anne Fraser Thomas. DAYBREAK is a coming-of-age story, centered around the dark places people may go when they feel lost, broken, or alone. It is about relationships, family ties, love, loss, expectations, dreams, patience, and change. Cast will include: Jennifer DiNoia (current Elphaba standby on Broadway) as Kelly, Kasey Marino (B'way Hairspray) as Dylan, Tricia Tanguy (Marvelous Wonderettes Off Broadway) as Rebecca, David Gordon (Grease European Tour) as Jamie, WILLIAM DEMANIOW on piano, JOHANNA PINZLER will direct the reading. Tricia will join a variety of NY/NJ performing artists in NYC at 7:30pm at The Midtown Theatre on 46th St. (between 6th & 7th) in a benefit concert to assist in the relief efforts in Japan. Proceeds will go towards efforts to provide aid to those suffering in the aftermath of the tsunami and earthquake. Broadway Speaks OUT and Dixon Place present Broadway Sings for Japan, a benefit concert for Japan earthquake and tsunami relief, March 28 at 7:30 PM at Dixon Place (161A Chrystie St, NY NY). ​Tricia will be singing Bobby Cronin's "Daybreak" with Jenn Furman, Brett Teresa, and Paul Wyatt. As part of the Revision Theatre's new concert series, [under]eXposed, Tricia will be singing Bobby Cronin's "Lucky In Love" and "Daybreak" with Jenn Furman, Brett Teresa, and Paul Wyatt on March 27th at 7:30pm at Mcloones Supper Club (1200 Ocean Avenue, Asbury Park, NJ). The evening will feature the music and words of Annie Golden, Adam Gown, Joe Iconis, Scott Alan, Angelyn Fullarton Benson, Brett Kristofferson, Bobby Cronin, Michael T. Murray, and Will Larche.